The amount of data flowing between countries has grown 45 times larger in the last decade and now has a bigger impact on GDP growth than traditional trade in goods. This visualisation shows the rapid growth in connectivity since 2005. In the ten years from 2005 cross-border inter-regional bandwidth between the USA and Europe has grown from less than 1,000 gigabits per second to more than 24,000 gigabits per second. Worldwide, the total amount of cross-border bandwidth used increased from 4.7 thousand gigabits per second in 2005 to over 210 thousand in 2014. It is estimated that this flow of data has boosted global GDP by 10% over the past two years, and was worth $7.8 trillion in 2014. Digital flows across the world have opened up the global economy to everyone with an internet connection. Smaller firms are now able to compete with larger multinationals. Of the tech-based start-ups surveyed, 86% report some type of cross-border activity. 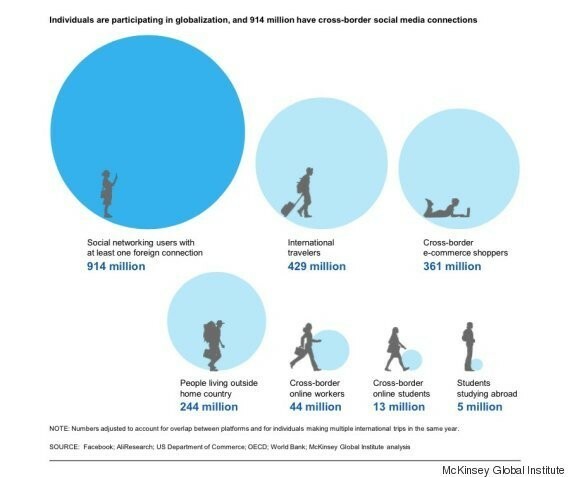 Individuals were found to benefit from the growth of cross-border connections in a wide variety of ways ranging from international social and business networking to international working and studying. Which countries are the most connected? The MGI Connectedness Index ranks countries on inflows and outflows of goods, services, finance, people, and data. Of the 139 countries surveyed, it found that in general advanced economies remain more connected than developing countries, with each type of flow being primarily concentrated among a small set of highly connected countries. Singapore tops the rankings, followed by the Netherlands, the United States and Germany. China has grown more connected, reaching 7th place. The report recommends that lagging countries focus on increasing participation in global flows to benefit the global economy. How will trade policy play out in cyberspace? How can Africa boost its bandwidth?